Okay in v1.1, I've added maxbans.seesilent as a permission node. Players with this node will see silent punishments. Staff on my server like to know when and why a certain player was punished. And it could stop any possible abuse from staff, sort of. Like if one day a staff member goes rouge and starts banning players, the other staff won't really be able to tell what's going on if he happens to use the "-s" in the command. I can add this, but may I ask why? You can silence commands by putting -s in the command somewhere.. like /ban asdf -s SomeReason will ban asdf for SomeReason without announcing it. Anyway you can add a permission node for who can see the punishment broadcast? ._. 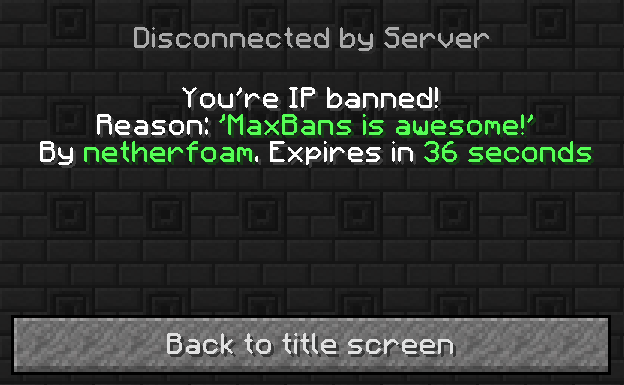 Could you possibly make it so that even bans via MaxBans get printed into bukkit's ban system? Just if in the case this plugin ever becomes inactive for whatever reason or if it breaks with future updates.. etc..? It would be pretty nice! You will have to add these new permissions. If someone had regular permission perms to ban before I added this plugin can they still ban? or do I have to add these new permissions? Most players on my server have up to a dozen alternate accounts. You can do /dupeip nameofplayer to find anyone else from their IP address, but there is no way of telling if theyre the owner of both accounts or just say... Siblings from the same house/school/connection. Where? You're IP banned makes sense, and your ip is banned makes sense too. quick question? when someone joins the server does it say to the ops if he has a alternate account? If not can you add that? Your* IP is Banned! Grammar Nazi! I like this a ton. D: Ill test it on my test server tonight. If Bukkit has bans loaded, Bukkit will deny players in banned-players.txt. If MaxBans has bans loaded, MaxBans will deny players in plugins\MaxBans\bans.db. Same applies to IP bans. So no, no bans will be wiped, unless you delete banned-players.txt/ips.txt. If you want to import those bans into MaxBans, you can try /mbimport vanilla, then it should be safe to delete banned-players/ips.txt. Will it work with previous bans in banned-players.txt/banned-ips.txt, even a simple ban message thingy mobboby? or will all bans be wiped? Me too, It'll take me a little while to do this though. Maybe in 1.1 or 1.2.